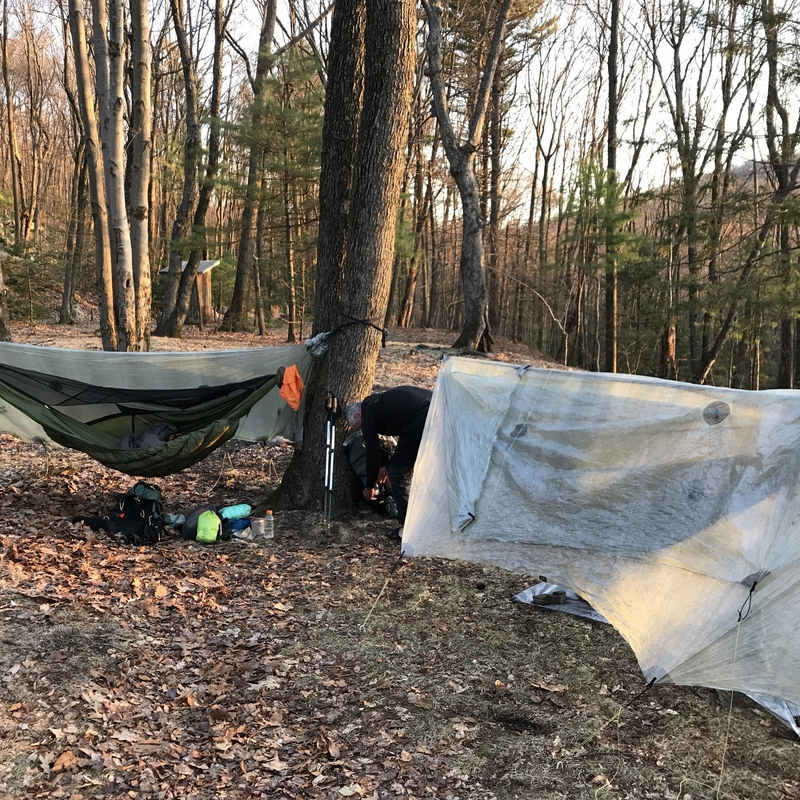 We’ve received a lot of questions about the logistics of thru-hiking while we’ve been on the trail. Unfortunately, because of limited cellphone service (or dead batteries), we haven’t always been able to write back. So, since we’re on a break right now — and our cellphones are fully charged — here are some details about our trek. Please note, though, that this is only our way of hiking, which is limited by our age and skills. 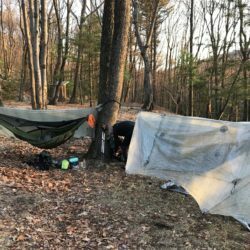 Other thru-hikers do things differently. How often do we go into a town? We try to check into a motel roughly every four days, depending on how close one is to the trail. We originally planned to stop only once a week to do laundry and shower, but we just couldn’t stand the smell. 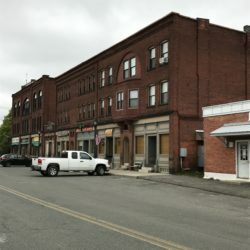 How do we get into towns? Some motels near the trail offer free shuttles. There are also local people who drive hikers into towns for a fee. A lot of people hitchhike, but we haven’t done that yet. How far in advance do we reserve hotels? Only a day or two. Our schedule is too unpredictable to book places much in advance. How often do we sleep in the open? Whenever we aren’t in a hotel (so five or six days per week). 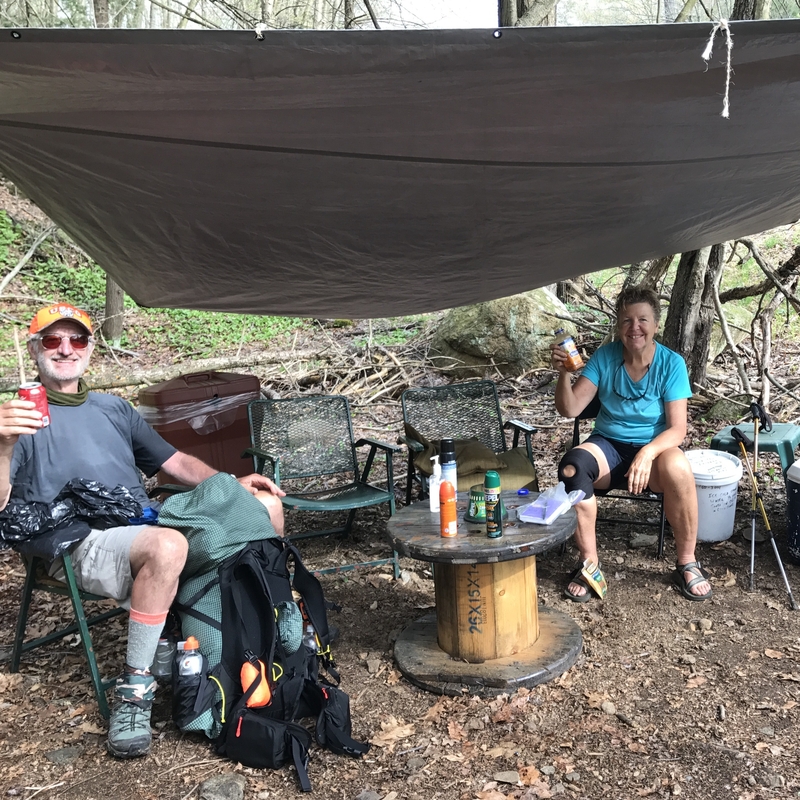 We either sleep in our hammocks or on a wooden bunk in one of the three-sided shelters along the trail. What is the trail like? Rocky and steep. Very occasionally there is a nice, soft path through the woods or an open field, but mostly the trail goes up and down over rough terrain. 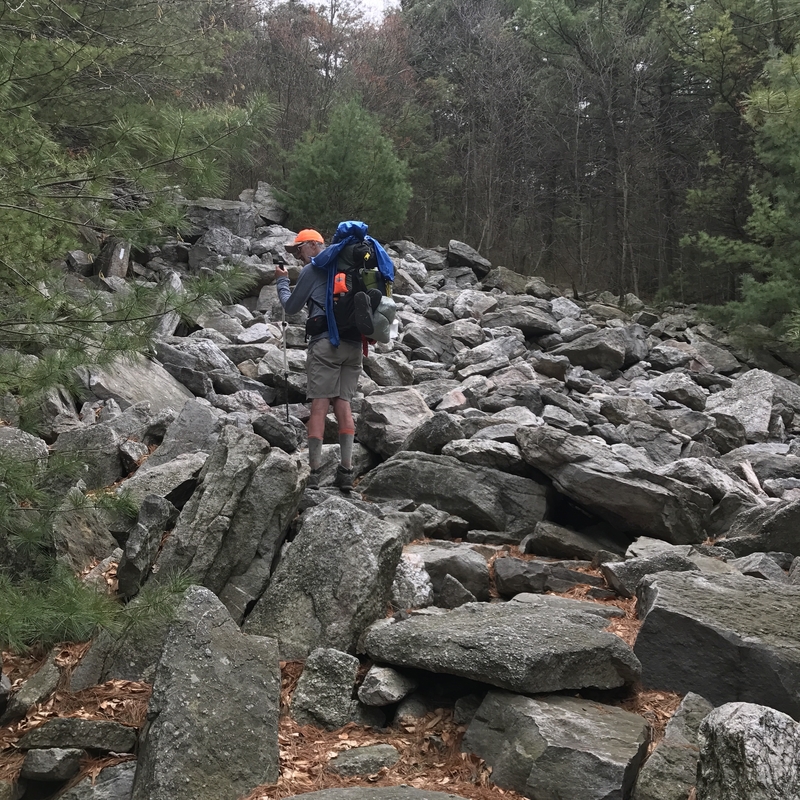 We are tackling the northern section of the AT first, though, and it is supposedly the toughest part. What is our daily distance? Right now it’s about 16 miles per day, but it depends on the terrain. Our average pace is 2 mph with loaded packs. Rocks can slow us down even more. (Our longest day so far is 23 miles.) A lot of hikers, particularly the young ones, go a lot faster and farther than us. What is our daily schedule? We wake up at 5am with the sun and birds. By 6am we’ve packed and are ready to hike. We stop every couple of hours to snack and filter water, and try to finish hiking by 6pm. We set up camp, bolt down a quick dinner, filter water for the following morning, and fall into bed by 7 or 8. 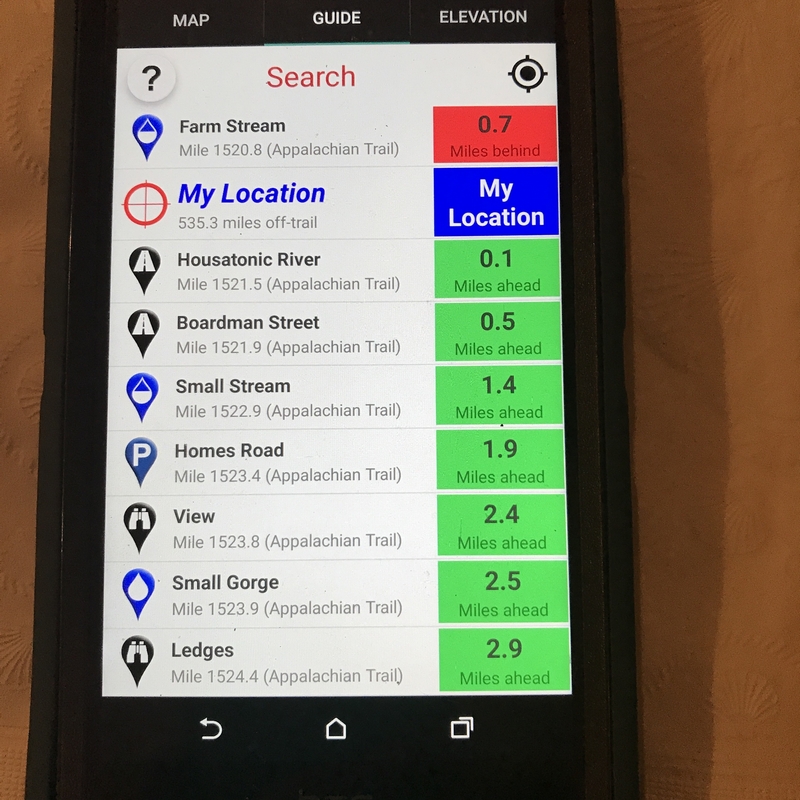 Is there cellphone service on the trail? Sometimes, but usually only when we reach a road or a power line cut on the top of a mountain. How do we recharge our cellphones? As long as I turn my phone off at night and keep it on airplane mode during the day (so I can take photos), my battery lasts for about three days. We also carry extra battery packs and plug in our phones whenever we get to a town. Even so, my phone is sometimes dead. What technology and guidebooks do we use? I carry the paper version of AWOL’s guide. John has the electronic version on his phone. He also has the Guthook app, which is amazing. It has maps and lots of other useful information about the trail, such as alternative places to camp. Best of all, it uses GPS to show us our exact location, keeping us from getting lost. (With the GPS on and the phone in aircraft mode it only uses 10% of the battery per day.) In addition to all that, we have a SPOT device to let everyone know we are okay each night and call for help in an emergency. Is the trail marked? 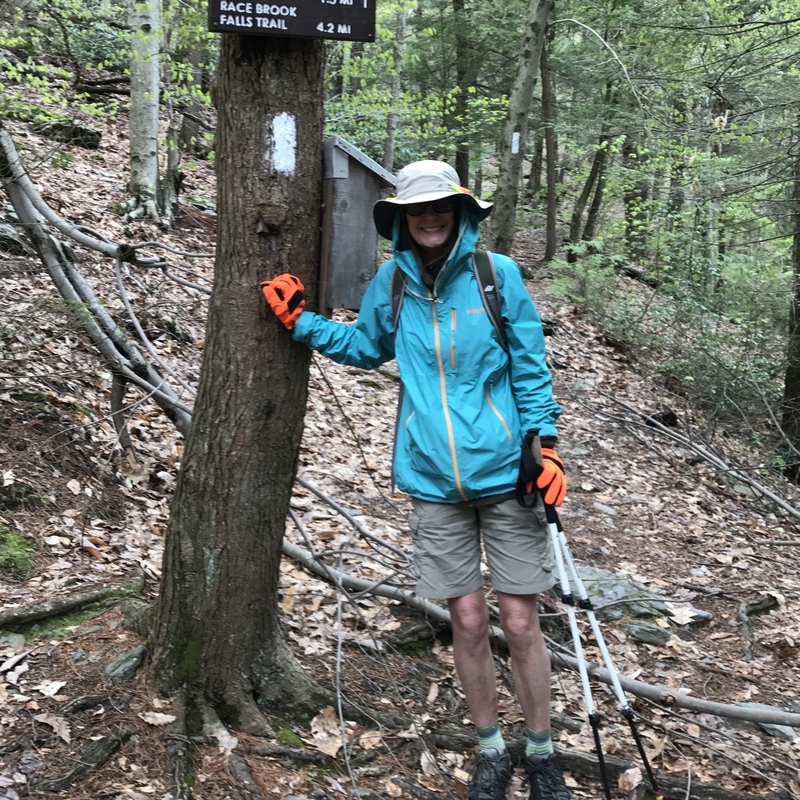 Yes, the Appalachian Trail is marked with white blazes. Most of the time they are pretty clear, but sometimes the blazes have faded or the tree they are on has died. (In rocky sections, the blazes are painted on rocks.) If we haven’t seen a white blaze in a while we go back to the last one we spotted to make sure we didn’t miss a turn. Who are trail angels? 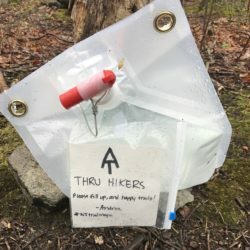 Trail angels are people who help hikers in some way, usually by giving them rides, water, or food. Sometimes they do it intentionally, such as setting up relief stations or leaving bottled water beside the trail. Other times it’s a spontaneous act of generosity. Their actions are called Trail Magic. How do we get water? Finding water is a critical part of each day. 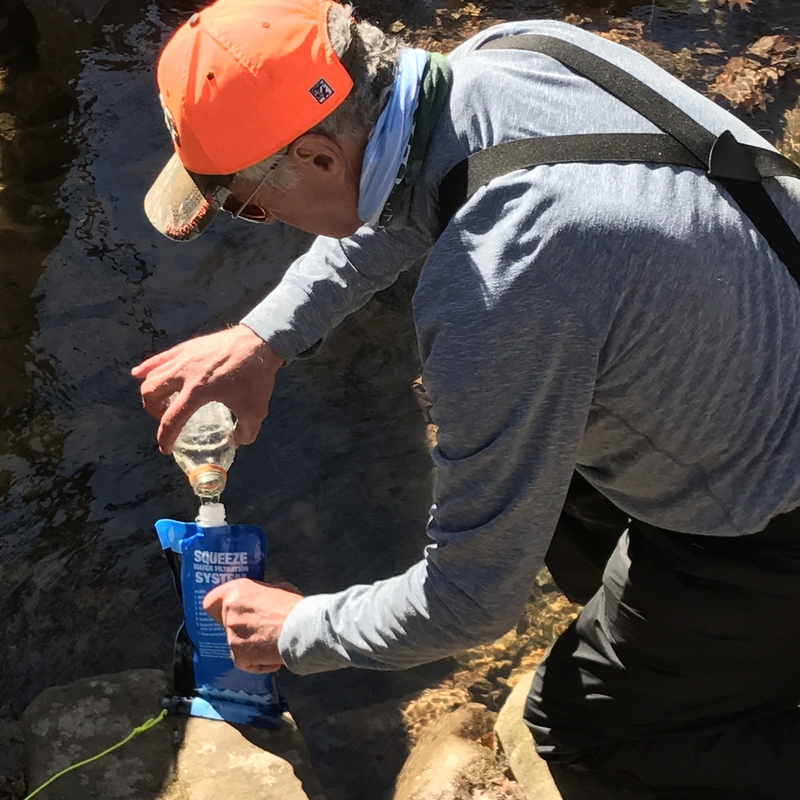 We constantly check our guidebook for springs or streams to make sure we don’t run out. (It’s also very heavy, so we don’t want to carry too much.) We always filter the water we drink and in some places, treat it chemically, too. 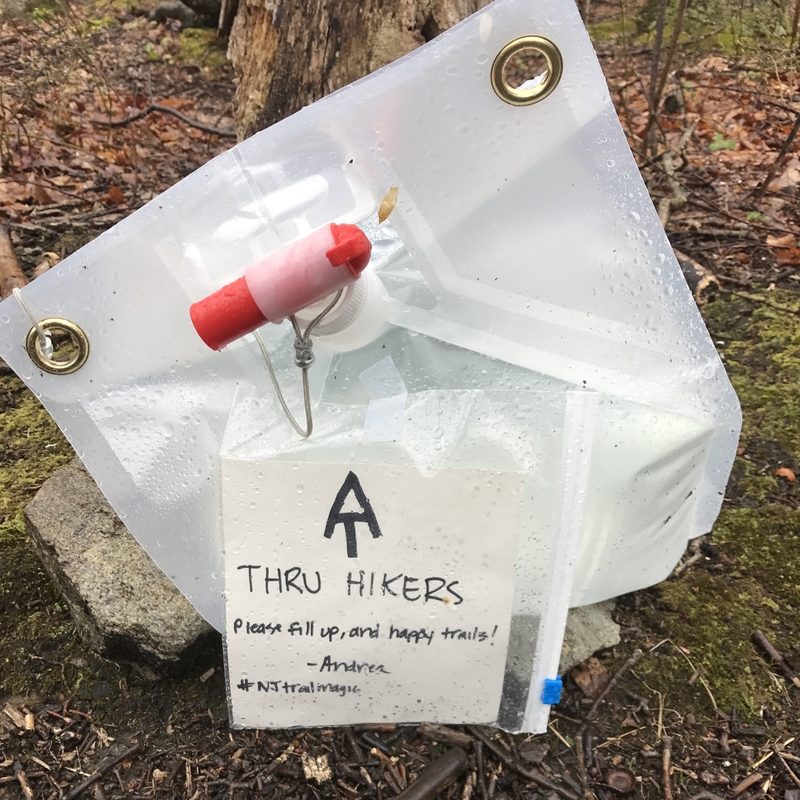 Some places near the trail (such as restaurants) let hikers use their spigots which saves a lot of time. How much do our packs weigh? My base weight (without food and water) is about 16 pounds. Food and water can add up to 10 pounds, depending on how long it has been since we resupplied. John’s pack weighs even more. I’d love to lower my pack weight, but between cold weather gear and hiker hunger, this is the best I can do for now. What is “hiker hunger?” Hiking for 10-12 hours a day burns up a lot of calories. After a few weeks on the trail, your body can’t keep up with the demand. The result is weight loss and raging hunger. You constantly need to eat. 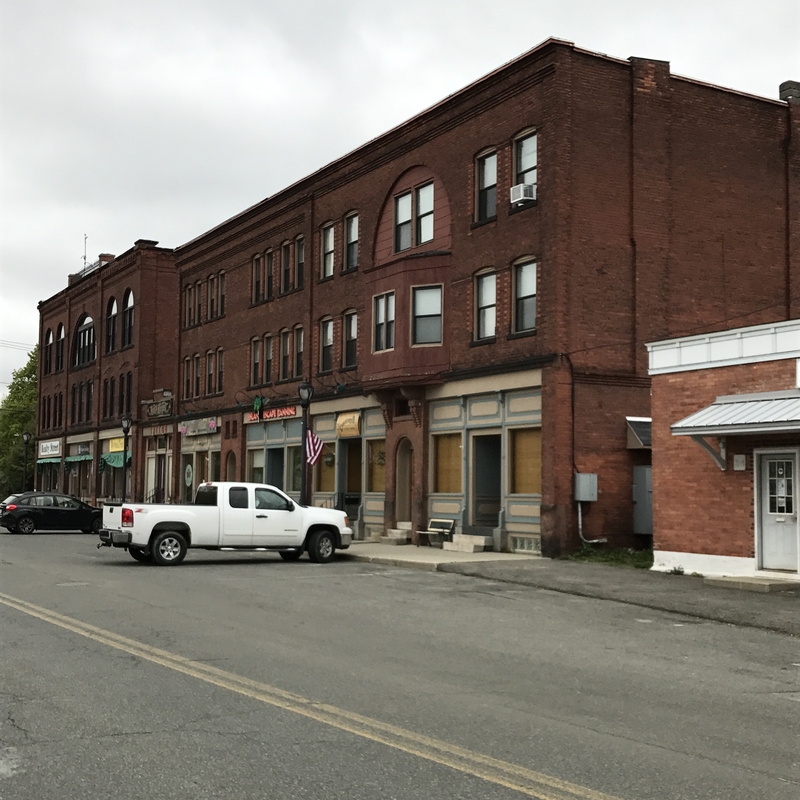 In towns, hikers will bolt down incredible quantities of food, and then two hours later be starving again. How do we get food? Some hikers depend solely on local stores to resupply. They hitchhike into a town every few days and stock up. We mailed ourselves weekly food drops so we could eat the food we like, then supplement with local buys. 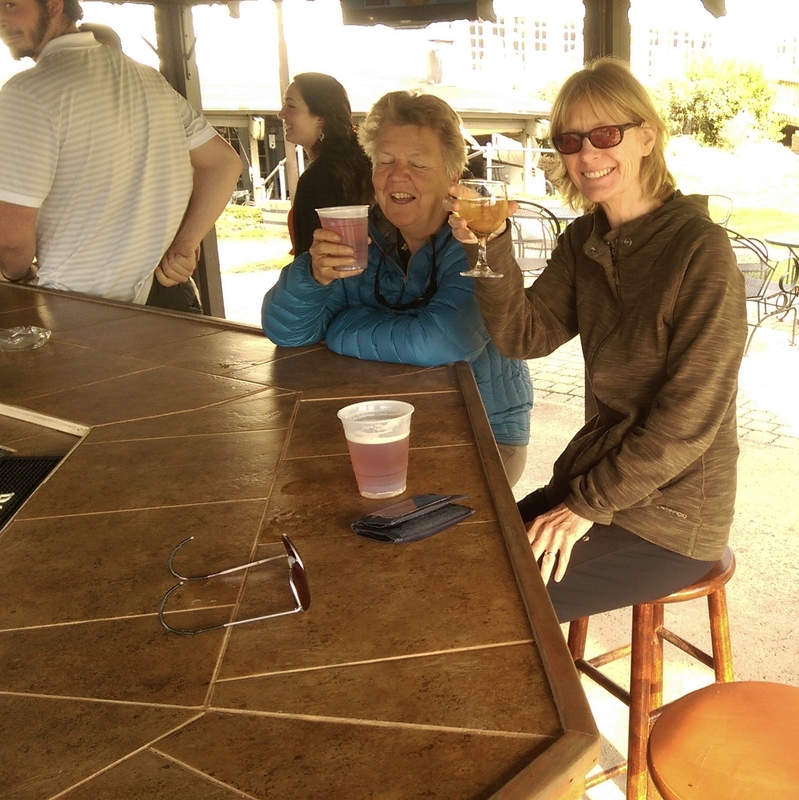 If we come across a bar, deli, or restaurant near the trail, though, we nearly always stop (see “hiker hunger”). What do we eat? Granola with powdered milk for breakfast (I add flax and chia seeds, dried blueberries and other superfoods to mine). Dried fruit, nuts, and M&Ms during the day. We eat protein bars for snacks. For dinner we boil water and add it to dehydrated mashed potatoes or backpacking meals (which we’ve beefed up with lots of dried vegetables). We also throw in whatever other lightweight foods we can carry like beef jerky or cheese. And of course, whenever we’re near a restaurant we chow down. How do we cook our food? We don’t. The most we do is boil water using a minuscule stove at night. And we eat everything out of plastic bags so there aren’t any dishes to wash.
What is a zero day? A “zero” day is a complete day off from the trail. A “Nero” day (near zero) is one where you only hike a few miles. Both are necessary to rest your legs. How long will the hike take? 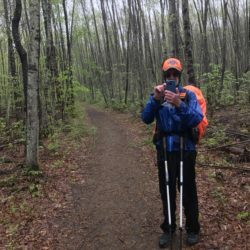 For most people it takes 5-6 months to hike the entire 2,189 miles of the AT, which stretches from Georgia to Maine. We expect it to take us at least six months, longer including breaks. What route are we following? We started at Harper’s Ferry, WV and are heading to Maine first. Then we will return to HF and do the southern section of the trail. 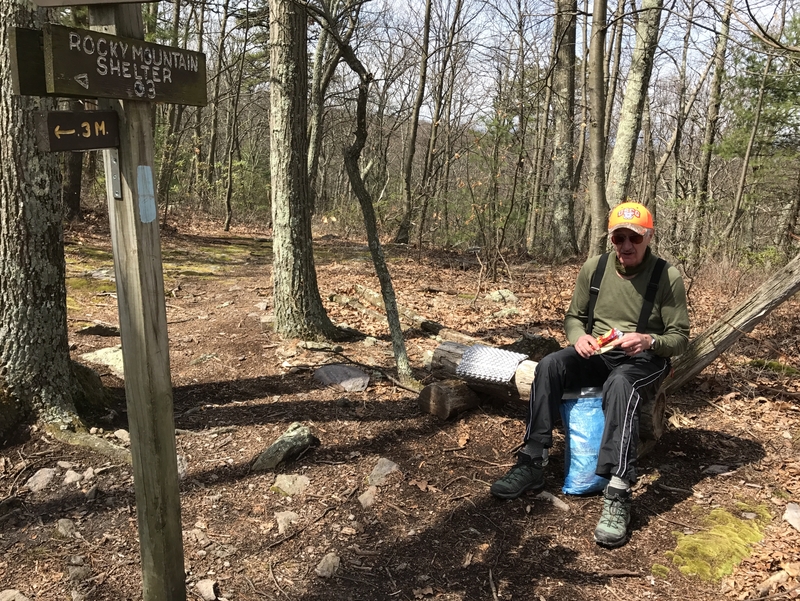 This is called a flip-flop thru-hike. We decided to do our hike this way to avoid the crowds in the south. 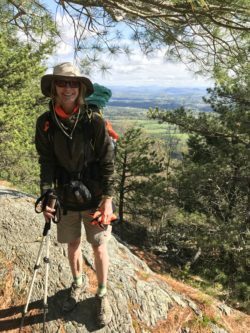 The Appalachian Trail Conservancy is encouraging flip-flop thru-hiking to reduce the impact on the trail. So that’s it. If you have any other questions, don’t hesitate to ask. Otherwise stay tuned. The adventure continues next week! Enjoying your account. Thanks. 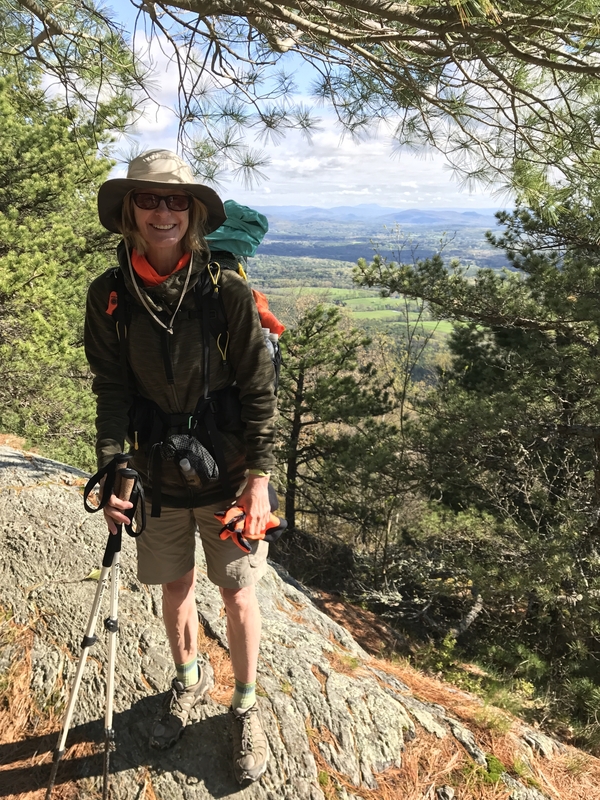 I get kicked to the curb by my airline next month (mandatory retirement age for pilots) and am planning to thru-hike the AT next summer with daughter, Nutmeg, and her BF, Earp. I’ve only been trying to do this for 40 years but could never get the time off. Appreciate the lessons learned. You’ll have a great time, Jack! It’s a wonderful way to start your retirement. Be sure to blog about it so I can follow along! Really enjoying your updates, candor and frankness! Hope you’re having a great time out there! Thanks, Dan. It’s more work than I thought it would be, but definitely worth it. I just hope our knees hold up! Enjoyed your post and hope you continue your thru-hike. 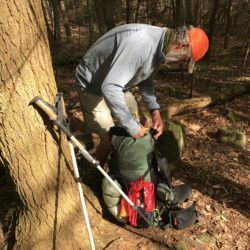 Myself, I plan to flip flop a thru-hike in 2018 starting also at HF. Pretty much the same thoughts the two of you had, avoid the crowds and be light on the land. Ticks have my full attention and was wanting to know what you two are doing to avoid ticks? 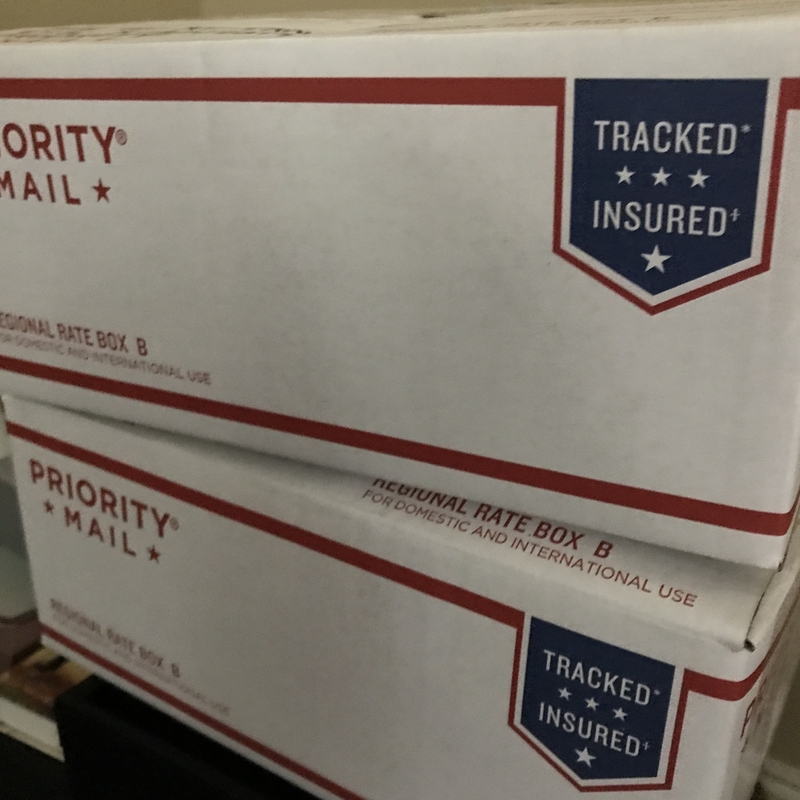 Take care and thanks for the post! Steven, we are really glad we flip flopped. 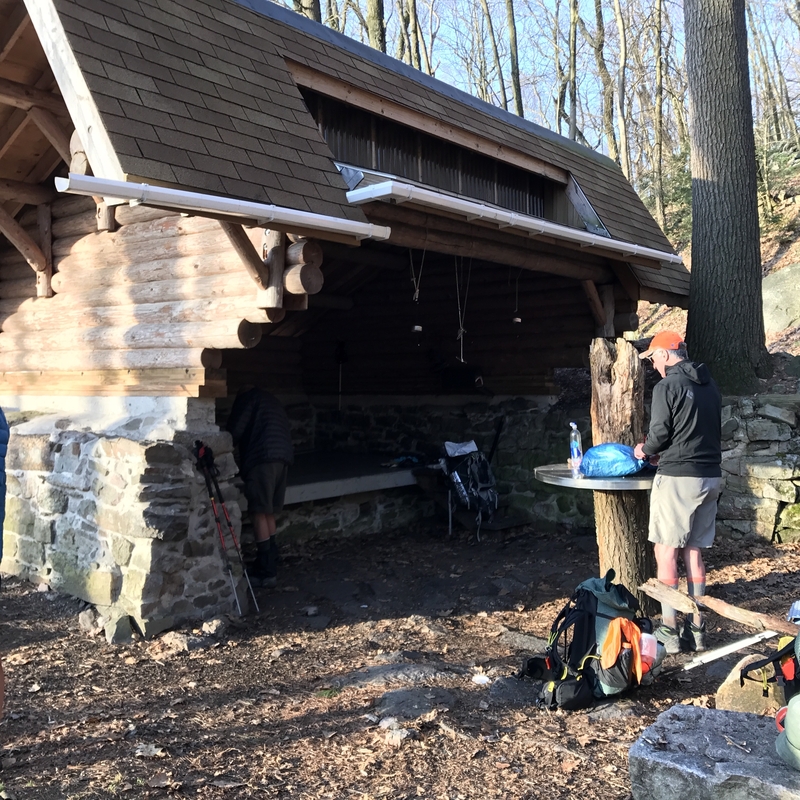 Despite the colder weather it has been a great way to experience the trail. And never fear, we will definitely continue the hike. We’ve already reserved the rental car to get back to the trail next week. As far as ticks go, we have been relying on permethrin so far. We soaked all our clothes in it before we started (and sprayed our gear), and just reapplied it during our break. We’ll do it again at least once more before we head south. We are spraying our legs with repellent, too. Gail, I continue to enjoy your posts. Ironically, I spent this evening packaging up some of my breakfasts I’ll use in July on the AT, and they are exactly like what you described. A wonderful way to start a day! Ruth, those breakfasts make a big difference. I’ve eaten something else a few times and really noticed the decrease in energy. The granola I eat has oats, hemp, pumpkin seeds, buckwheat, etc. I add two TBSP of chia seeds and a little packet of flax to that, plus the blueberries and dried milk. I think all the healthy fat provides a lot of fuel. I’ll be interested to hear if you have the same experience! I’m working on a novel right now set on the A. T. I’ve been reading a lot of book about thru hiking and this is great information. It seems to fit right in with everything I’ve read. I’ve also visited and hiked parts of the A.T. It’s amazing that people can do the whole thing in such a short time! Ms.Coco & The Gentleman Farmer – Building happy healthy relationships. I hope to write a book about it, too, John. It’s certainly a different world! We are just so proud of you and John! I love hearing about all of your adventures and seeing the photos – yes, even the snow. Can’t wait for the book. Thanks so much, Laura! We really appreciate the support! Gail.. Really enjoy reading about your adventures. My best friend and I are planning a section hike on the A.T. Your book will be an awesome read! Thank you for sharing and educating those who hope to follow! Rest well and resume your hike safely!! Thanks, Vicky! I’m sure you’ll love your hike. 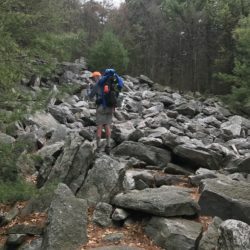 I really think that section hiking is a better way to do the AT. All the section hikers we’ve met have been having a lot of fun and seem much less focused on the goal of finishing. In contrast, some of the thru-hikers have appeared a little grim. Which section are you planning to do? I am so enjoying your updates. I chose to follow you because of your age(close to mine)–I wanted that perspective, which is much different than someone much younger. We have a friend in his 40’s hiking NB and I follow him too. 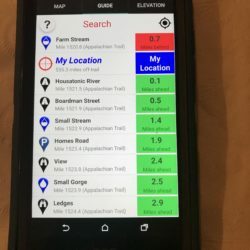 I also follow a couple of young hikers–so interesting to compare the updates. Thank you again for sharing–Happy and Safe Trails to you! I agree, Brenda. I think it’s a very different experience for younger hikers, usually more of a party atmosphere. (That’s another reason we chose to flip flop. We didn’t want to feel as if we were caught up in spring break.) I sure envy their strength, though. We have to keep reminding ourselves that 40 years ago we would have been just as fast. 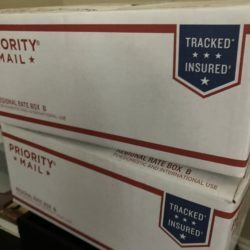 Love every post and can’t wait for the next one. Not going the southern route first, do you think it might be to hot? What time of year are you thinking of doing that? You two are amazing!! Sherry, we intend to do the southern part as soon as we finish up north so that we can complete the entire trail before winter weather sets in. So that means we will be hiking south in late July, August, and September. It will be horribly hot, and finding water will be a challenge, too. We’ll have to carry more water so that we don’t run out, which will increase our weight. There really isn’t any way to avoid that, though. There are pros and cons to any way you hike the trail, and the heat in the south is a downside of ours. 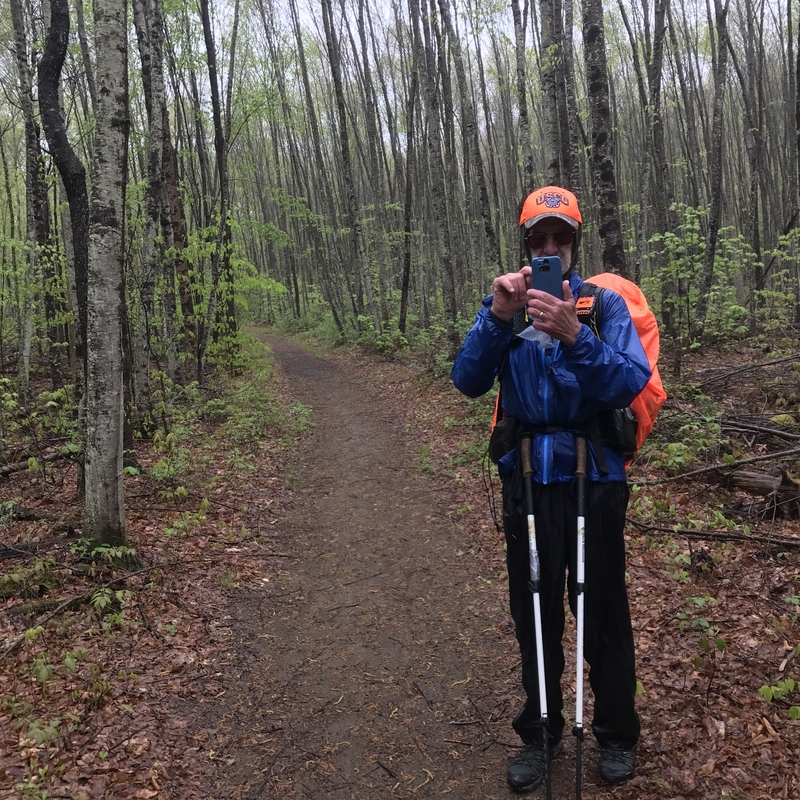 On the other hand, we would have been miserable hiking in “the bubble” (the thousands of hikers who are all hiking in the same direction at the same time) and we’ve really enjoyed experiencing the forest by ourselves up north. You say you had no backpacking skills prior to hitting the trail. Did you do anything to prepare? A little backpacking? Some training? Cindy, we live close to the Appalachian Trail in Maryland, so for the past year we hiked on it a couple days a week or more to try to get into shape. Once we got our gear we camped out a few times to see what that was like, too. 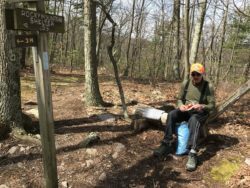 We also spent every spare minute reading books, articles, and blogs about thru-hiking. All that helped, but we still felt unprepared for a hike of this magnitude. Luckily, we had Barfly with us at the start. She is a very experienced backpacker and her advice was invaluable. We sure miss her! Gail, you are a real inspiration for me. I will be turning 65 this July and I am giving considerable consideration to thru hiking the AT next year (2018) starting in March or April and like you, doing a flip flop. I lost my wife to cancer June 15th. 2015 and have been sort of lost since then. Maybe I could find myself again thru hiking the AT. Love reading about your journey. Maybe, occasionally, you could tell us what gear you are using, weight you are carrying, what is working and what isn’t, etc. Have John chime in now and then to give his perspective. Wishing you both good karma and hopes for a safe and eventful journey to the end. Bob, I’m so sorry about your wife. What a terrible loss! I doubt anything can make that kind of grief go away, even thru-hiking, but it does change your focus for a while. It gives you a chance to escape your ordinary world and time to evaluate things. When I started this hike I thought it might lessen my grief over losing my dad, but the pain is still as raw. I now believe it will always be that way. But I am learning a lot and changing, getting physically and mentally stronger with every mountain we climb. And meeting trail angels has helped reaffirm my belief in humanity. So overall, this has definitely been worthwhile. As far as the equipment goes, that’s a great idea. I’ll blog about that soon! Thanks so much for the suggestion. And if I can help you prepare in any way, just ask!